A complete curriculum vitae of my work in historic preservation. 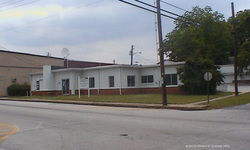 The photograph is the 1951 Old Clinic or Old Library. It was the oldest International design in West Georgia. A fight to save the building continued for years until the city and the downtown development authority demolished the National Register Eligible structure in 2007 for parking, which is used no more than the use previously behind the building. A complete curriculum vitae of my work in archaeology. 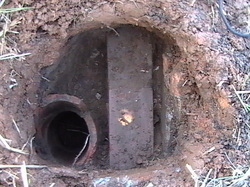 The photograph of a shovel test with foundation and terra cotta drain spout. This excavation was based on Sanborn Maps of a historic house. The site was registered with the Georgia Archaeological Site Files. Masters level coursework include 18 hours specifically in archaeology methods, theory, CRM and regional archaeological studies. Academic curriculum vitae for higher education. Experienced with teaching United States History, Georgia History, and special topics in historic preservation. 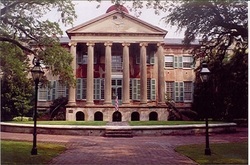 Adjunct teaching assignments include College of Charleston, Georgia Highlands, and Middle Tennessee State University. With a terminal MFA in Historic Preservation, post graduate masters and Ph.D. level work in history and 18 hours in anthropology (specifically archaeology, and a BA in anthropology), I am able to teach history, historic preservation, and anthropology under SACS accreditation rules. Contact me at blevins@alumni.cofc.edu or use the form below.